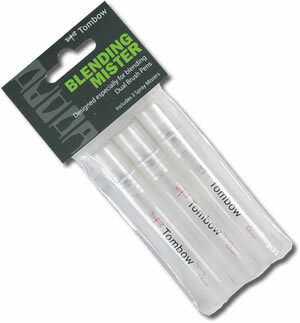 The Tombow Blending Mister was developed for use with Tombow Dual Brush Pens but is an extremely useful piece of equipment in any water based artwork. The pack contains 3 x 8ml containers which can be used to create a fine mist over a large area or up close for a more precise spray. The mister can be used to keep moist blending palettes or watercolour work and create any number of effects with its easily directable nozzle.